Accidentally split the trunk! Help! 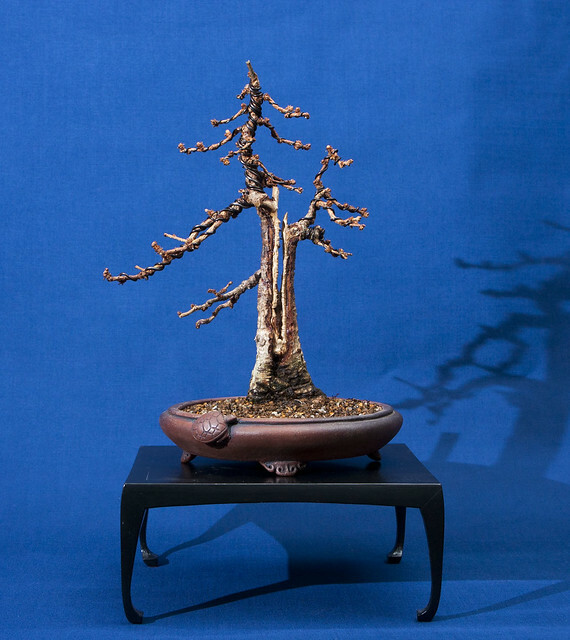 Hi there, I'm relatively new to the work of Bonsai. Loving every minute of it though! Whilst trimming back and bending my juniper shrub I have managed to spit the trunk down the middle. About 2cm straight between two medium sized branches (ill put up a photo when i get a chance). I was wandering what the best way of repairing this might be? I was thinking Kiyonal sealant and some florist tape should do the trick? Any suggestions? Re: Accidentally split the trunk! Help! liam.longbottom wrote: Hi there, I'm relatively new to the work of Bonsai. Loving every minute of it though! I'm not certain if you are talking about a verticle split or a horizontal split. Crazy glue for wood will work really well if we are talking about a verticle split but if you split across you are in deep doo-doo. It's a vertical split. In the middle of a "V" shape of two branches and down the trunk..
Vance, I've read about using super glue but have always wondered: is it intended to cover the entire break surface to seal it? People are in general kind of ignorant of how a tree really heals in a situation like this. You can wrap the tree and the opposing sides of the wound will in fact grow together but the split is still there and always will be. The entire split will not heal together because the only portion of the tree that has a growing potential is the cambium layer below the bark. That will heal but the split will still be there substantially weakening the trunk. Gluing the trunk together will still allow the cambium layer to fuse but the split portion of the trunk will also be fused together. Gorilla Glue will also work but it is slower to set and requires that the split be closed for a time splinted together while the glue cures. i hate it even more when the obvious makes perfect sense and was overlooked (by me). as always, thanks vance ! Just remember, trees MEND; they do not HEAL. That happens to all of us. We tend to want to accept the evidence of our eyes in some cases where that evidence is only superficial. On re-thinking this issue I think the glueing is even more important if the branch is actually a critical element in the design of the the tree. There will always be stress on the joint and if it is not anchored properly it will always be an issue. Somewhere down the line it would probably be best to start thinking of a design that eliminates that particular limb. Vance Wood wrote: Somewhere down the line it would probably be best to start thinking of a design that eliminates that particular limb. which is the exact end result of my split... branch eliminated. I am really glad you have learned to adapt and think by the seat of the pants. I have had this happen doing a public demonstration. And when you apply glue to a split or break make sure to apply it to the inside or old wood not on the cambium. Then you may tape,wrap a wire around it or a zip tie it to hold it together. Vance Wood wrote: I am really glad you have learned to adapt and think by the seat of the pants. Vance Wood wrote: I have had this happen doing a public demonstration. and thanks mike, thats what i was thinking and was going to ask for verification on this reply to vance. Broken my share of branches. Well that way at least you won't be surprised if you break one Kevin. And now you will know what to do if one does break. M. Frary wrote: Well that way at least you won't be surprised if you break one Kevin. And now you will know what to do if one does break. Better yet: If you expect one to break, take proper care & prepare the branches so that they do not, cannot, break..
big words tough guy !!! "THIS BRANCH WILL NOT BREAK !!!" but i pulled it off w/o incident... will post pics in different thread. beer city snake wrote: oooooh... "cannot" ??? Lol. Maybe I meant more something along the lines of: You know where the risks are, so you do not take risk, and you wrap things up, And you take extra care when bending. (That being said.. My last "snap" moment was about 2 months ago, with a crucial branch in the upper canopy. So.. slowly back the branch went. Tape came out, and the tree was left alone..